The third time’s a charmer! October 7, 2018 Alumni, Business & Hospitality, Construction & Design Technologies, Corporate Relations, Events, Faculty & Staff, Industrial, Computing & Engineering Technologies, Nursing & Health Sciences, President, Sciences, Humanities & Visual Communications, Sports, Students Comments are disabled after 182 days. The disparate threads of Homecoming and Parent & Family Weekend were woven together again this fall, producing another seamless tapestry of fun and reconnection for graduates, current students and families. The third annual combined celebration kicked off with a Friday bonfire, tent party and Hall of Fame Banquet; continued Saturday with a presidential breakfast, Williamsport bus and trolley excursions, lab tours, a golf outing and on-campus sporting events, arts and crafts, and an alumni reunion at downtown nightspots; and concluded Sunday with more athletics and a fond farewell (until next year)! A fiery snap, crackle and pop fill the fall air. Gathering prior to the Hall of Fame induction ceremony are, from left: Skylar L. Gingrich, Amber L. (Geckle) Dreese, College President Davie Jane Gilmour, Kierstin G. Steer, and Athletics Director John D. Vandevere. Alex A. Klose, a student in heating, ventilation and air conditioning technology, shows some of his tools to his mother and grandfather. Klose is from Bethlehem. Shortly before the tent party, they got engaged! Ryan A. Gibson, ’16, aviation maintenance technology, proposed to Morgan N. Keyser, ’17, graphic design, at her grandparents’ farm – a short drive from campus. “The Rock” reflects the open-armed warmth of campus. Dylan C. Godinez, of Reading, immortalizes a weekend of family fun. He is an engineering design technology major. Reo, the service dog of Ryan S. McCrickerd’s father, Bryan, was among guests enjoying Breakfast with the President. McCrickerd, also joined by his mother, Roseann, is an aviation maintenance technology student from Bethlehem. Todd Moore, student affairs marketing specialist, registers families for trolley tours of historic Williamsport. Phi Mu Delta member Robert P. Borden, a welding and fabrication engineering technology student from Glastonbury, Conn., wire brushes his truck’s battery terminals during the fraternity’s car show. Pointing the way to morning munchies are student leaders Ethan M. McKenzie, a software development and information management student from Muncy, and Lindsey A. King, applied health studies, of Hanover. A tempting variety of food trucks, representing wares of local vendors, serve patrons west of the Athletic Field. Michael T. Weber, whose parents (Tom and Mary Anne) traveled from Millersville, shows Dad his heating, ventilation and air conditioning technology lab. A campus tradition returns to the Madigan Library Lawn. Enjoying the autumnal alumni evening (from left): Timothy D. Haldeman, ’11, manufacturing engineering technology; Michael D. Ferraiolo, ’10, aviation technology, and ‘11, aviation maintenance technology, and guest, Melyssa McHale; and Whitnie-rae (Mays) Haldeman, ’12, advertising art, and ’14, applied technology studies. First-year construction management students from assistant professor Wayne R. Sheppard’s Construction and Program Orientation class join members of the women’s volleyball team at Saturday’s game. The students are encouraged to attend various campus activities, but there is a catch: They have to wear their personal protective equipment, which includes hard hat and safety vest, to the events! Alumnus Bryan Waltz (left), manager of telecommunications and networking, and Marc E. Bridgens, associate professor of HVAC technology, fill their scorecard with smiles. The Wildcat men’s and women’s tennis team huddle in solidarity before their Sunday match against King’s College. Displaying potted succulents crafted at the Wildcat Postgame Tailgate are Shelley L. Moore, director of career services, and daughter, Gabrielle E., a physician assistant studies major; and Tanner A. Huff, an engineering design technology student. … befitting the college branding on the right-field bullpen. Light up the night in celebration! The president greets the grandparents of Madison Y. Cooper, a women’s volleyball player (who was unable to attend Breakfast with the President due to warming up for her Saturday games). Cooper’s grandparents traveled to campus from Harrisburg to balance breakfast and athletics. Sharing the limelight are (from left) Von A. Gushka, White Haven, plastics and polymer engineering technology; Alexa D. Scatamacchia, Fleetwood, culinary arts technology; Autumn L. Schabener, Reading, baking and pastry arts; Abbey R. Mefferd, Boyertown, culinary arts and sciences; and Seth A. Kirkman, Export, heavy construction equipment technology: Caterpillar emphasis. Steer’s family members attending the Hall of Fame banquet included her daughter, Harper, and her sister Jamie, also a former Wildcats standout athlete. The brothers of Phi Mu Delta hosted their third annual charity car show, benefiting St. Jude Children’s Research Hospital. More than a dozen members of the college’s chapter of the Student American Dental Hygienists’ Association provided oral cancer screenings to the public during Homecoming and Parent & Family Weekend. They were joined by dental hygienists (some of them alumni) and dentists, who also volunteered their time. Alumni circle ‘round (from left): Nicholas P. Mancuso, ’12, business administration: marketing concentration; Britni M. Fennell, ’17, manufacturing engineering technology, automated manufacturing technology and machine tool technology; Erin Bannon, ’13, health information technology, and ’16, health information management; and Rachel E. Heller, ’14, engineering design technology. Flowin’ with the Wildcat Blue! Myal Soul wows the tent-party crowd. 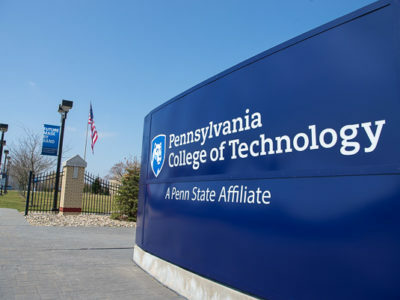 Illuminated in enticing blue, these trees stand out – just like the students, families and graduates who reveled in their Penn College connection all weekend long. Student photographer Rachel A. Eirmann (second from left) joins a reunion of counterparts who also shared their considerable talents in the job. From left are Caleb G. Schirmer, Haldeman and Marc T. Kaylor. Welcoming “Wildcats on Pine Square” (AKA alumni 21 and older) are Kimberly R. Cassel (left), director of alumni relations, and Elizabeth A. Biddle, director of corporate relations (and holder of two Penn College degrees, among others). Connections program student assistant Kacie C. Snyder (left), of Bangor, and presidential student ambassador King welcome visitors to open labs in the Breuder Advanced Technology & Health Sciences Center. Ryan LaPerle, a Boston-based singer/songwriter, entertains the Friday night crowd. Ian J. Schoenleber, ’17, automotive technology: Honda PACT emphasis,, enjoys a round of golf with his father, Joseph. Sigma Nu alumni gathered for a croquet game. A fun project that mirrors the hands-on nature of what we do. The Wildcat pumps up the fans in the stands. The Witherow family savors breakfast and bonding in Capitol Eatery. Emily G. Witherow, of Perkasie, is enrolled in building and sustainable design: architectural technology concentration. Loni N. Kline (left), vice president for institutional advancement, and Cassel watch the action from the concession area. The Wildcat Club treated fans to free hot dogs, burgers and other refreshments (prepped by Dining Services staff), and offered information on how alumni and others can financially support student-athletes. Breakfast with the President is a hit with diners in Capitol Eatery! Volleyball coach Bambi A. Hawkins (right) makes a memory with Dreese, Vandevere and Gilmour. Hawkins, who introduced her former player, is also the learning laboratory coordinator for paramedic/emergency medical services. Ryan P. Farabaugh (second from left), an information assurance and cyber security major from Cresson, joins the family art show with sister Hailey, mother Jennifer, grandmother Joan Kinback and brother Brandon. Among the finds at the car show is a 1978 MG Midget. Wildcat golf coach Matt Haile shows the form that has made him an inspiring mentor for 10 seasons. The Blue Team scores, one of five runs in its half of the first inning. On with the weekend, rain or shimmery shine. Brewing and fermentation science students in their element: Luke H. Brown (left), of Beaver, and Ryan J. Hampton, of Williamsport, ready to serve up some drinking-down deliciousness. Gingrich savors celebration with his former baseball coach, Chris Howard (right), Vandevere and Gilmour. … as midday sun and shadow mix for women’s adjacent play. Under the lights: culinary delights! Honoring his losing end of a college football wager, Vandevere takes infield practice with the team. A Wildcat Blue glow greets guests at the Hall of Fame gathering. In the Machining Technologies Center, Isaac E. Shaw, a machine tool technology student from Millerstown, explains some of the equipment to his family, including his parents, grandmothers and sisters. Rhonda S. Walker, alumni relations specialist, puts her cart before the course. We can’t throw a party without hospitable helpers! Hospitality management students Ireland Q. Hastings (left), from Shippensburg, and Mallory Hoffman, of Pottsville, offer assistance and smiles. Building construction technology instructors Barney A. Kahn IV (left) and Levon A. Whitmyer (right) fill the frame – and their foursome – with Andrew Levering and Josh Williamson. The Williamsport Bureau of Fire (and Penn College Police) were close at hand for safety’s sake. Steer, who was introduced by her former basketball coach Alison Tagliaferri (left), poses with her Hall of Fame ring (in commemorative box), Gilmour and Vandevere. Giveaways await tent revelers: Wildcat glassware stuffed with chocolates made by baking and pastry arts students. Kathy Poust (left) presents her team of radiography alumna Beth Shaner Kelleher; plastics alumnus Zach Poust and Williamsport Area Community College graduate Lynn Poust. Penn College’s Vance Gradwell (who had one of the Wildcats’ three goals in the shutout win) tests Cazenovia’s keeper. Gingrich brought along a large team of supporters for his “MVP role” at the athletics banquet. The bling is the thing! Hall of Fame inductees show of their rings and necklace. Teammates become rivals, but only for the day, honing their collective skills before winter. Following the athletics banquet, attendees strolled over to the tent party, where Dreese hung out with her husband, Daniel S. (at right), ’02, computer information systems; and former volleyball teammates Elizabeth (Mast) Petersheim (left), ’07, accounting; and Maria “Mia” K. McNett, ’07, occupational therapy assistant, and ‘09, applied health studies. Steer delivers remarks following her induction. The Blue and White teams talk pregame strategy following introductions. The Wildcat Club, fans who are also financial friends, receives a shout-out during the Athletics banquet. The president delivers a warm welcome to Hall of Fame guests. Reveling in reunion are (from left): Erin Sullivan, ’16, applied human services; Semeon De Barros, ’17, aviation maintenance technology and applied management; Victoria L. Kostecki, ’14, baking and pastry arts, and ’16, applied management; Sarah A. Brunksi, ’17, culinary arts and systems. Following her remarks, Dreese receives a congratulatory hug from one of her fans. A tableau of tomfoolery is formed by Joseph C. Peters, ’12, civil engineering technology; Jordan Bair; Phil A. Bair, ’14, building science and sustainable design: architectural technology concentration; and Keaton Macut. A slideshow of the newest Hall of Famers’ athletic careers plays in the newly renovated Thompson Professional Development Center’s Mountain Laurel Room.